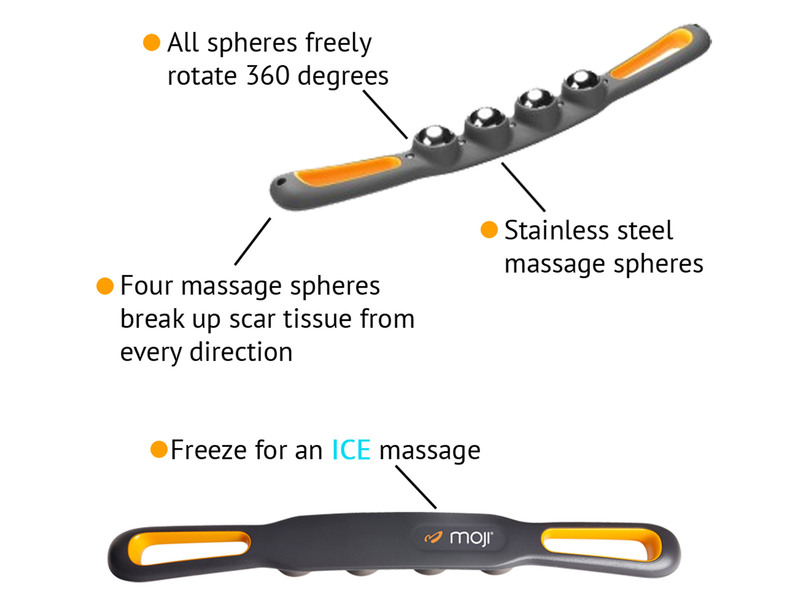 Combining the unique design of 360° rotating spheres with the incredible added benefit of ICE therapy, the Moji Curve PRO Massager is your ultimate self-treatment device. The design of this easy to use roller massager has considered everything you could want from a myofascial release tool. The main feature of 4 large stainless steel spheres provides an incredible ice Massage. Simply place in the freezer for 30 minutes and the steel spheres will go ice cold, giving you incredible relief for sore and tight muscles. 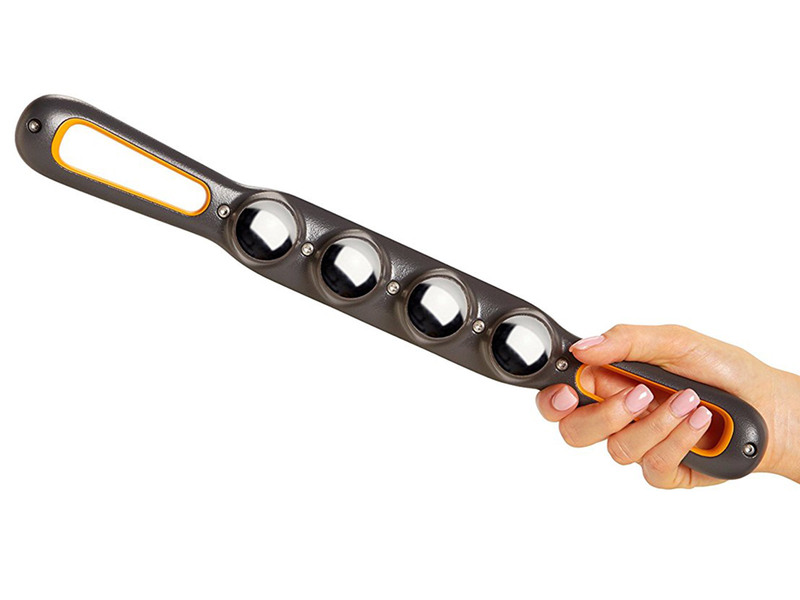 Unlike other massagers, the large stainless steel freely-rotating massage spheres offer a 360°massage, giving you the ability to administer a variation of self-massage techniques. With easy to grip handles at either end, you can efficiently manoeuvre the massage stick around your affected area, applying as much pressure as you wish to relieve muscle aches and pain. 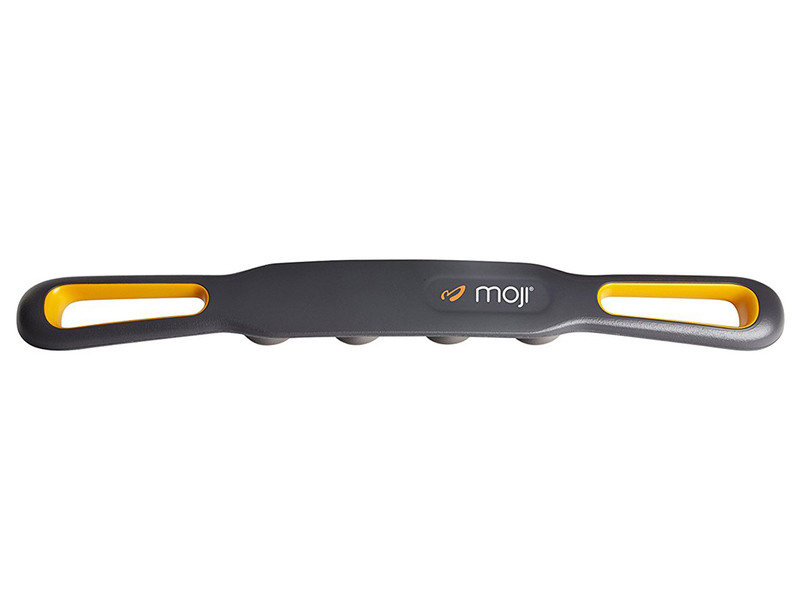 The Moji Curve PRO Massage weighs 0.8kg and is incredibly strong to withstand added pressure when in use. At 48cm long this full body massager is lightweight, portable and travel-friendly, so you can easily take it with you in your kit bag. Great for easing your aching muscles at the end of a hard gym session or after your sport and activities. The spheres dig deep into sore muscles to relieve pain and break up scar tissue. Recovery is the key to improve your strength and performance, with the Moji Curve PRO Massager you can give your muscles the best chance to recuperate, so you're ready for action quicker. When you use the massage roller stick the action of rolling helps to compress and stretch the muscles, which not only provides relief from soreness but also helps to increase circulation and remove tension. 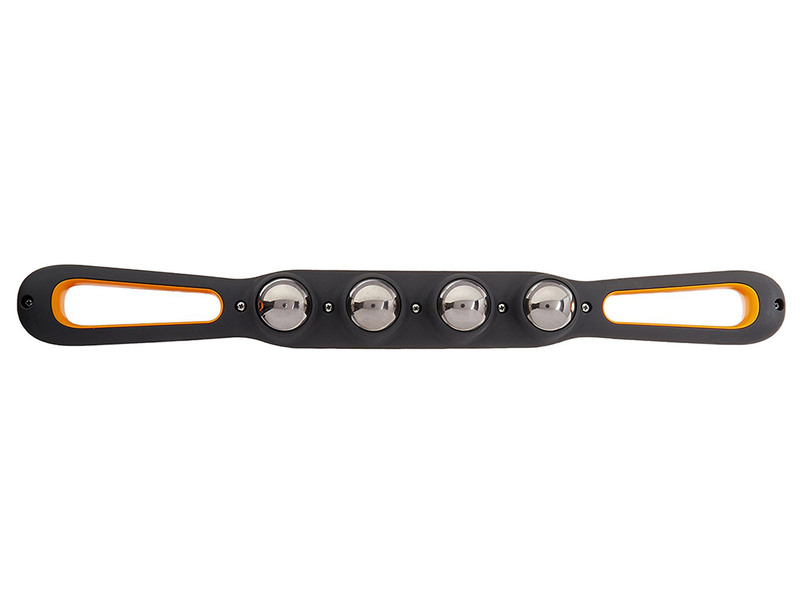 You can also use the massage roller to warm up muscles before an event or workout. The rolling massage stick will aid the flow of blood and nutrients to muscles, helping you to increase your flexibility and mobility, whilst also supporting the prevention of injury, cramps, knots and stiffness during exercise. Watch this video to learn how to massage your quads to relieve muscle soreness and tightness by using the Moji Curve PRO. This massage can be used as a warm up before exercise, a recovery cool down after, or simply to relieve soreness and tightness in your legs at any time. Watch this video to learn how to massage your hamstrings with the Moji Curve. The techniques shown are great for a pre workout warm-up or post workout recovery cool down. How to recover after a workout using the Moji Pro Line. Enjoy a refreshing ICE massage to help reduce inflammation, mange swelling, reduce pain levels, and recover faster. 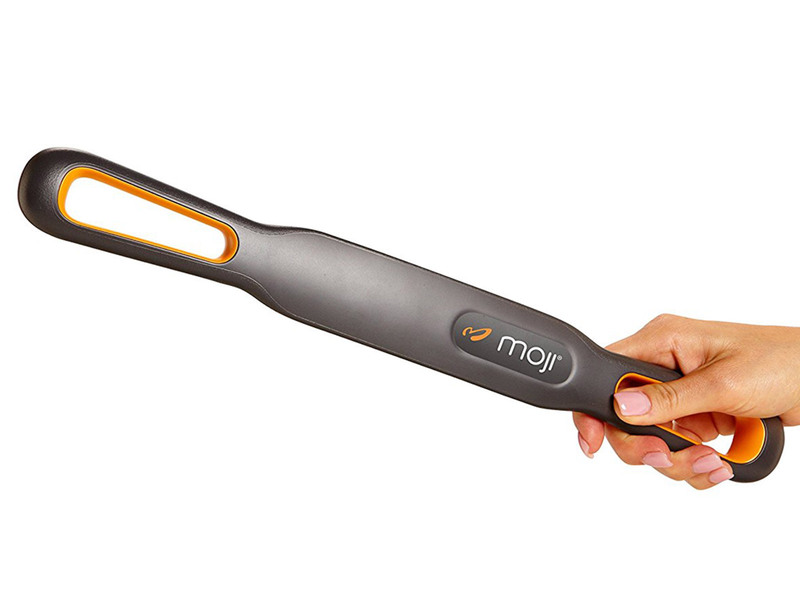 The Moji Curve PRO is a professional grade stick massager. Often used for fitness recovery, this massager is great for relieving muscle soreness, pain and tightness. The Moji Massagers are an incredible tool to help you self-massage and relieve sore and tired muscles. 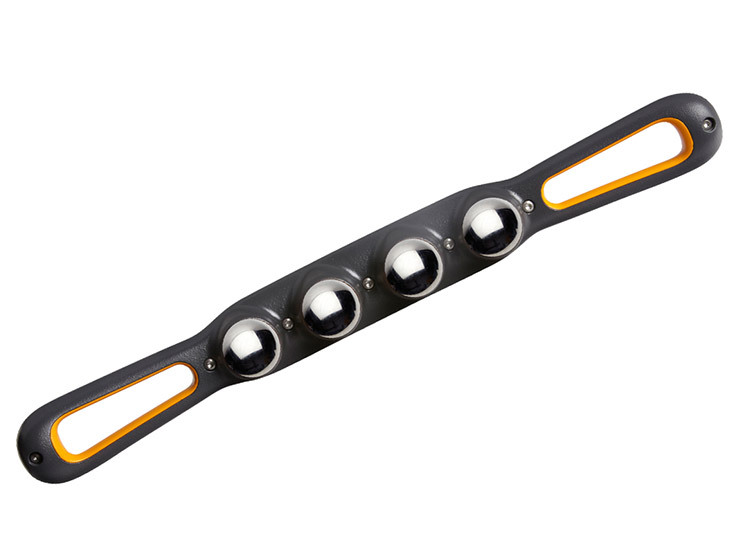 Expertly designed and simple to use, Moji massage rollers will help keep you or your clients in top condition. Oh my goodness! Can I just say how much I LOVE MY MOJI! I have brought it to work with me & even shared the love with my co-workers. It feels amazing on my quads and hamstrings. i look forward to getting home and rolling my sore muscles out every night, while plopping down on the couch and watching tv. It’s amazing how much of a difference the structure of the curve pro is compared to basic foam rollers. I am truly in love with this product, have already recommended it to some friends and family members, and cant wait to try more! Thank you to for allowing us the opportunity to try these incredible products and all your company has to offer. I have not put it in the freezer yet, but I plan on trying it out this weekend!